Much of the oxygen we breathe is produced by Earth’s huge diversity of plants. But more abundant than any plant species is an organism that lives in the sea. It is a single-celled cyanobacterium called Prochlorococcus, and it is ubiquitous. 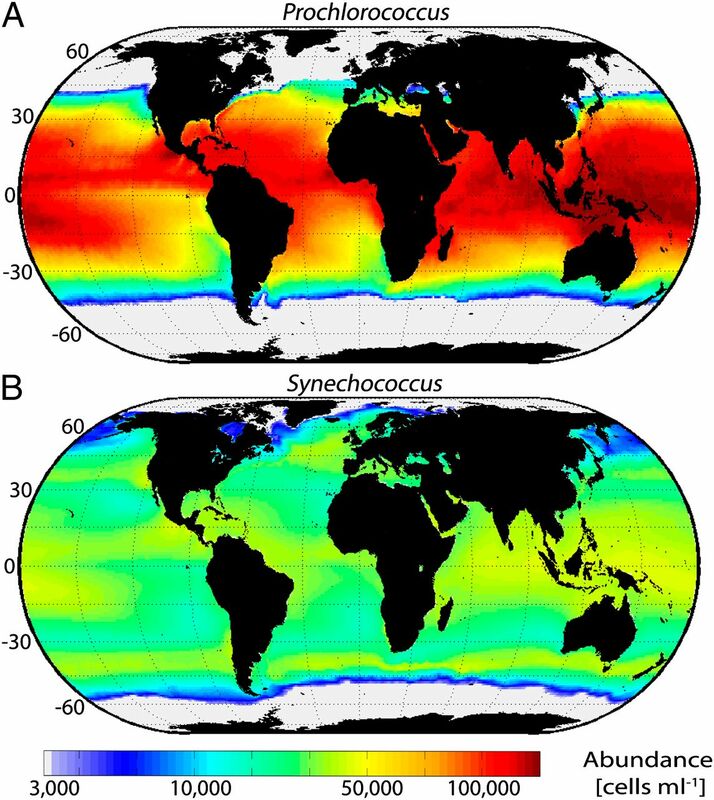 From the shores of Portugal past the tip of South Africa, the seas are full of Prochlorococcus. Every year, an estimated 2.8-3.0 octillion (1027) individuals come into existence. By biomass, Prochlorococcus is the most abundant photosynthetic organism on Earth. Top: Worldwide distribution of Prochlorococcus. In the red areas, there are 100,000 cells per milliliter of water. Bottom: distrubition of an organism that is similar to Prochlorococcus. It is distributed more widely across the Earth, but is less abundant. // Image from PNAS Vol. 110 No. 24, 9824-9. How has this organism become such a major player in the global ecosystem? Contributing to the organism’s success is its ability to live in areas with few nutrients, places where most other living things would die. Another contributing factor is its ability to live at many different light levels in the ocean. It thrives both at the surface, where it is bright, and up to 200 meters deep, where less than 1% of sunlight can reach. The organism has special features that allow it to live and photosynthesize without much food or light. First of all, it is tiny. It is only about 0.6 micrometers in diameter, which means even with an optical microscope it’s almost impossible to see. Just one milliliter of water can hold 100,000 Prochlorococcus cells or more. Its smallness means, on a basic level, that it needs very little food. But it also means that the organism is able to absorb the nutrients it does need more efficiently than larger organisms, because of the ratio of its surface area to its volume. The membrane through which it absorbs food is large compared to the miniscule volume that the food nourishes. For that reason, Prochlorococcus can take in a large amount of nutrients relative to what it needs. Perhaps more impressive is the organism’s ability to survive, in some situations, with virtually no light. The livelihoods of photosynthetic organisms depend on their ability to capture light rays. How can it be that a phototroph can survive – and even thrive – in what is basically pitch darkness? The answer lies in the specialized light-harvesting machinery that Prochlorococcus has evolved. To make oxygen, most organisms use a molecule called chlorophyll. The molecule absorbs sunlight, and then facilitates its conversion to usable energy. Prochlorococcus contains chlorophyll too, but it’s a special version of the molecule. In fact, the type of chlorophyll that exists in Prochlorococcus has been found in just one other species on Earth. This modified chlorophyll absorbs blue light more efficiently than normal pigments. Blue light penetrates deeper into the ocean than red, orange, yellow, or green light. Consequently, an organism able to use blue light for photosynthesis is more equipped to thrive 200 meters below the surface of the ocean than other life forms. Because Prochlorococcus is able to use a part of the wavelength spectrum not as readily available to other organisms, it can survive at deeper levels than other phototrophs can. On account of both its size and the unusual ways it uses of light, Prochlorococcus has succeeded where other organisms have failed, and become one of Earth’s dominant primary producers. But the full extent of its success and the role it plays in the global production of oxygen is still under investigation. No one knows exactly how many forms of Prochlorococcus exist, or how they differ based on the types of nitrogen available as a nutrient. Ongoing research has an eye to what global change in temperature might mean for Prochlorococcus, because even a small change in the organism’s growth or distribution could mean a big change for the world.